Lauren Meehan drives the ball towards the paint, drawing a foul. 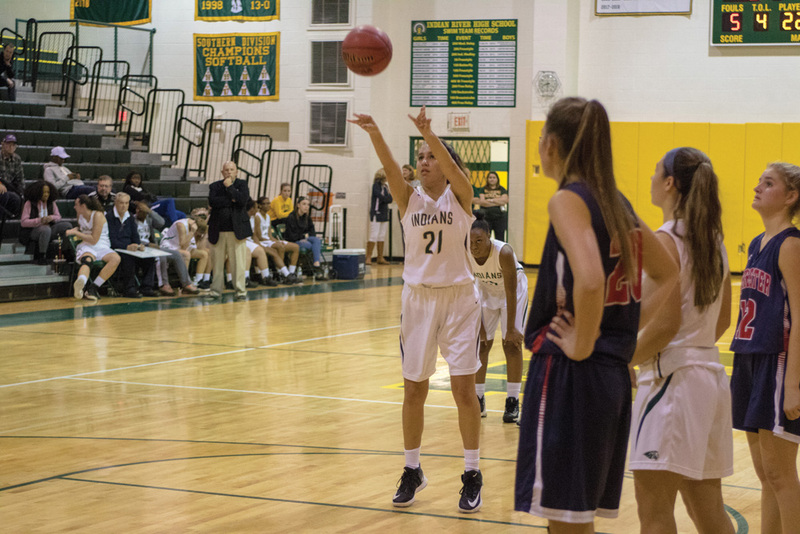 LeAnya Garrison looks to pass in the girls’ loss to Worcester Prep in Indian River’s Tip-Off Classic this past weekend. Through those pains — with practice and game experience — they hope to continue to have the same type of feeling they were able to experience following Tuesday night’s 34-23 wire-to-wire win over visiting Laurel. In the Dec. 4 win, senior Julia Jordan led the way with a game-high 12 points, as seven different Indians found their way onto the scoresheet. Sophomore Lauren Meehan followed with eight points, while her twin sister Micayla Meehan chipped in with five. Freshman LeAnya Garrison added four markers. For Laurel, Devonna Sheppard and Couri Smith each scored a team-high eight points. Nakayla Smith added five as well. 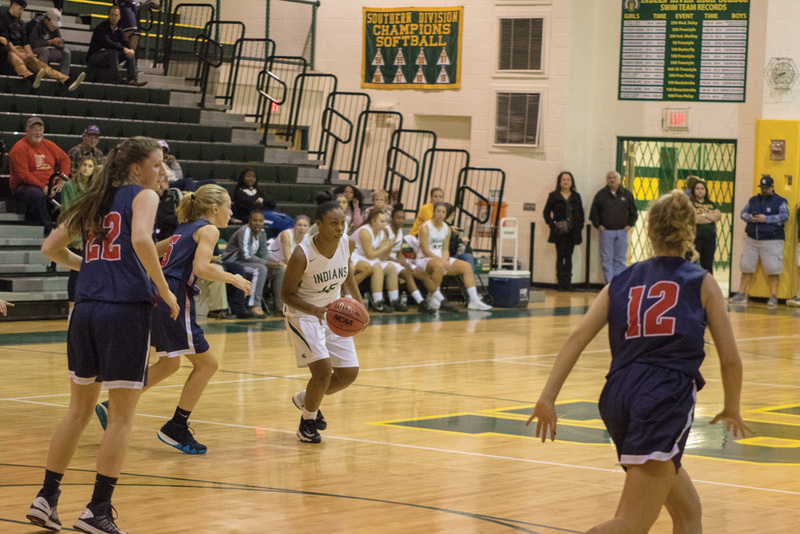 In their first two games, during last weekend’s Indians Tip-Off Classic, IR fell to Worcester Prep (59-24) on Friday, Nov. 30, and Delmarva Christian (46-20) on Saturday, Dec. 1. 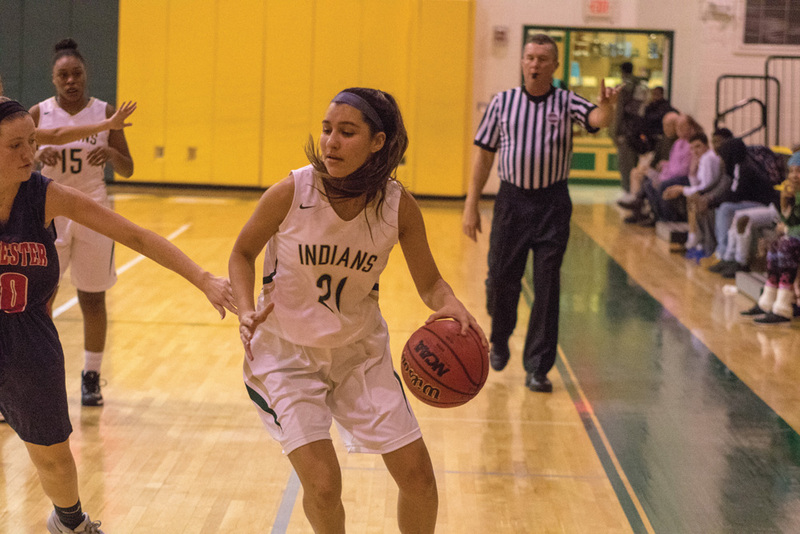 The Indians were set to host Woodbridge on Thursday, Dec. 6, (after Coastal Point press time) before hitting the road for their first away contest of the season, at Seaford on Tuesday, Dec. 11. Results of those games will be available on the Coastal Point sports Facebook and Twitter pages.